Thursday 15. March 2018 - The promises for it to be an event of great appeal to the flexo printing industry were all there but the huge turnout of Open House visitors greatly exceeded expectations. 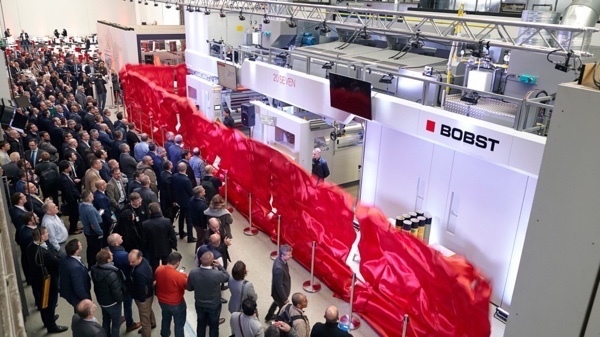 On 27 and 28 February 2018, the Competence Center of Bobst Bielefeld was filled to capacity with over 400 leading packaging converters and industry suppliers who travelled to Germany from more than 20 countries to discover BOBST’s new 20SEVEN CI flexo press optimized for Extended Color Gamut (ECG) printing and learn more about the ECG process. The 20SEVEN indeed made a show of the expanded process consistency it delivers. This derives from a number of technical features relating to press vibrations, ink consistency in dosing and metering, drying at high speed and register tenure that have been engineered to give consistency, accuracy and repeatability to the printing process. In addition to highlighting the 20SEVEN’s excellent performance, the printing demonstrations of commercial and mock packaging with multi-lane graphics, and the laboratory quality check that followed, also demonstrated the advantages of the ECG process. The Delta-E color analysis of the same print job carried out in the morning and repeated in the afternoon showed how the process can ensure brand owners of their packaging color consistency, so important for their brand recognition, anywhere in the world. Other time and cost benefits for brands and printers were presented during the wide-ranging review of the ECG process delivered by industry partners – brands, users and industry suppliers – who joined BOBST in the event. At the close of the Open House, satisfaction ran high at Bobst Bielefeld “Being complimented enthusiastically on the new press is very gratifying as it rewards our pursuit of innovation and excellence in equipment and process performance.” commented Jens Torkel, Managing Director and Head of CI Flexo Product Line, Bobst Bielefeld “We have hit the mark with converters because we have succeeded in improving the machine functions that are fundamental to ensure process repeatability in wide-web flexo printing. The press is ideal for ECG but it also brings enhanced performance with conventional printing. This makes the 20SEVEN a win-win choice in any situation”.